Good morning. As my blog name implies, I am an avowed tea-drinker. And I haven’t done a tea review in a while now. Lately, as the weather cools down, I find myself reaching for more rich black teas, sometimes with milk and a touch of sugar, or else a more-oxidized oolong tea. So I thought I’d share a few of the things I’ve been drinking that I rather enjoy in the chilly weather. 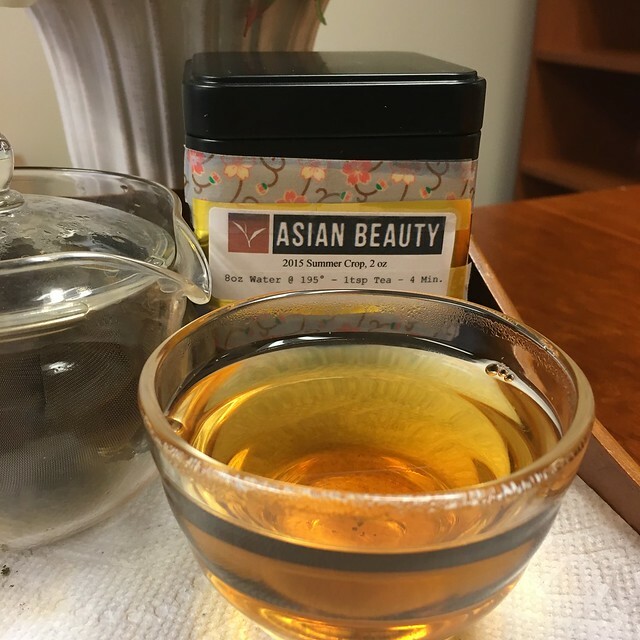 Beautiful Taiwan Tea Company Asian Beauty Oolong: This was my autumn transition tea. It is a large-leafed, moderately-oxidized oolong that gives a robust, amber-colored cup of tea. It does tend towards bitterness if brewed too hot or for too long, and I find this is one of the few oolongs I actually prefer brewed Western-style than in a gaiwan. And, of course, given my love of Asian beauty products, I couldn’t resist the name. Harney and Sons Black Tea Sampler: As I’ve mentioned before, when the weather gets cold, I turn to rich black teas. The thing is, I tend to drink a lot of breakfast tea with milk and occasionally sugar, and then a lot of Earl Grey. Not a lot of variety. So I decided to get myself a four-tin sampler set of black teas from H&S this autumn. It includes teas from China, India, Sri Lanka, and Kenya, which is a nice assortment and goes beyond the standard Assam and Darjeeling teas I know and love. I believe my favorite is the Kenilworth Sri Lankan tea, but all of them are distinctive and have their appeal. If you’re looking to expand your black tea horizons, these samples are varied and generous for the price. Harney and Sons Earl Grey: Of course, I couldn’t go all autumn and winter without a nice Earl Grey. So I bought a four-ounce tin of H&S Earl Grey. It’s a rather large amount of tea, which is perfect for everyday tea drinking. If I’m not in the mood for something specific, I generally turn to the Earl. This is a nice blend, not too bergamot-y, and not too bitter. It handles oversteeping when I occasionally forget about my tea on a busy morning. And it doesn’t send me bouncing off the walls with caffeine, but it’s a proper morning pick-me-up. A solid Earl Grey offering. Disclaimer: I purchased all products described and was provided no incentive for review. I have not used any affiliate links.